First time I ever worked an airport ticket kiosk. I like dealing with people, not machines. 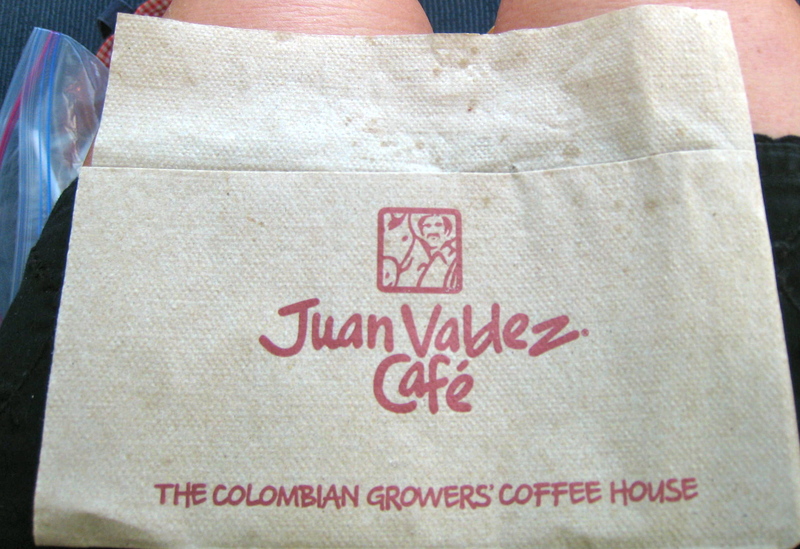 We left for the airport at 6:30 am on Sunday, August 2. The car service picked up five sleepy people and 11 pieces of luggage and dropped us at Newark Liberty Airport. We checked in using one of the Continental Airlines kiosks, got our boarding passes and headed for Security, one behind the other, all quiet. At Security we worked our way through the line and offered up our boarding passes and passports, removed our shoes and walked through the metal detector while our carryon luggage and shoes wended their way through security on the conveyor belt. On the other side I noticed my daughter Tory was hopping around on one foot, talking to Security personnel. Listening, I heard her insist that two shoes went into the scanning machine, but only one shoe came out. Security personnel were baffled and Tory was upset. . .she bought those sandals in NY specifically to wear in Jamaica. One look at the stubborn set of her jaw and I knew Security was going to have their hand’s full if their machine didn’t spit out her shoe, pronto. As Security personnel looked under the machine, in the machine and around the machine, the line of people waiting behind Tory kept getting longer and longer. No sandal. Tory stood there. Waiting. No sandal. After a few minutes the female Security guard asked Tory to check her carryon bag once again to see if the shoe had slipped into it. Practically rolling her eyes, Tory complied. She rooted around in her bag. . .and came up with the missing sandal. She was amazed. We moved on. Breakfast at Newark Liberty International Airport can run you some money. $50 later we had our breakfast in hand and waited to board our plane. The flight was almost four hours of uneventful; for that I was profoundly thankful. 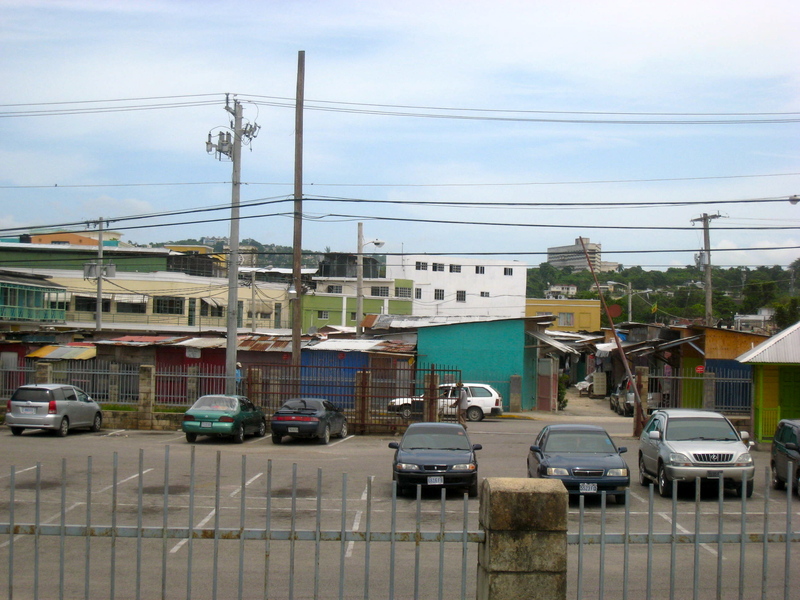 With a few hard bumps the plane landed and we made our way into the airport in Montego Bay. We had filled out our customs forms on the airplane and it took about 30 minutes to wend our way through the long line at Customs then meet our Apple Tours guide. We walked outside to our waiting bus and were smacked in the face with some pretty serious humidity and heat. Welcome to Jamaica, Mon! 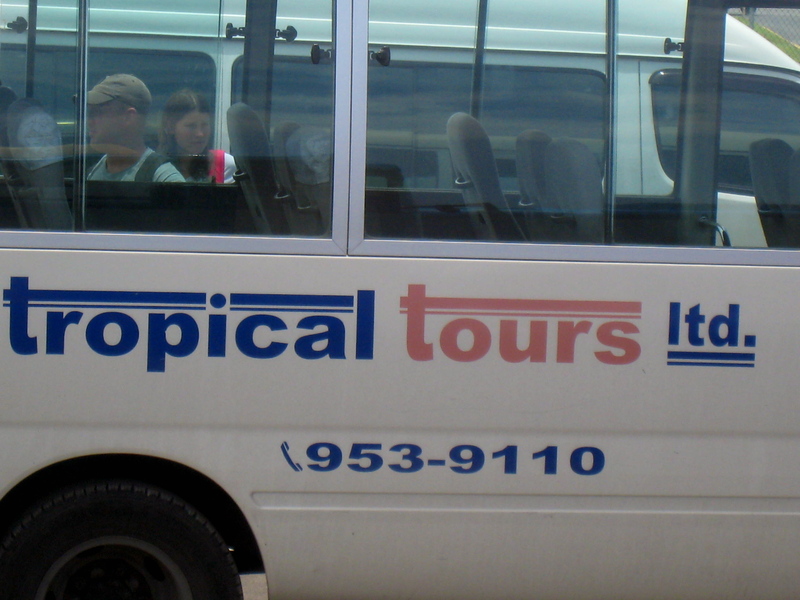 We stowed our luggage beneath our Apple Tours-sponsored bus and climbed aboard the barely air-conditioned vehicle. The bus drivers take a long time talking and deciding who has to take the next load of tourists to their destinations. After about 30 more minutes, we took off for the RUI Tropical Palace in Negril. I quickly realized that the pace is slower here, a lot slower! 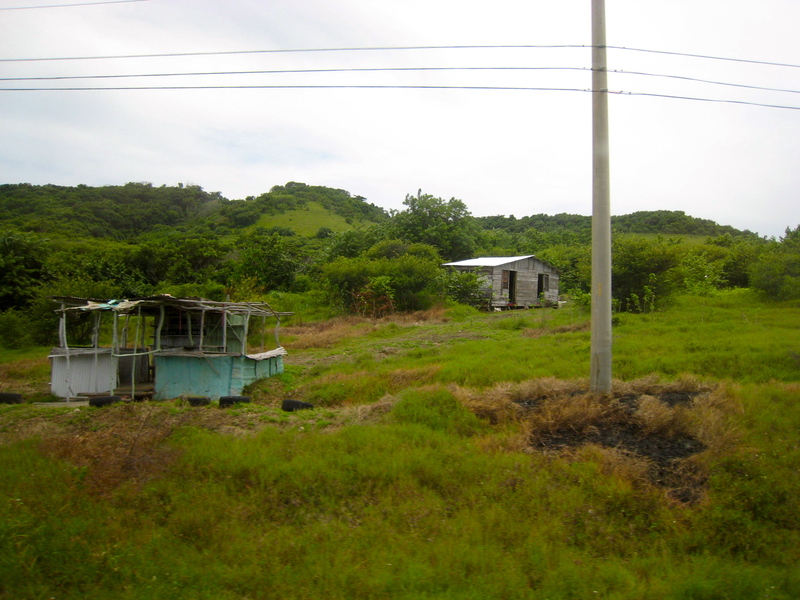 Here’s what I saw as we wended our way around the island to Negril. I saw at least three cemeteries on our way. 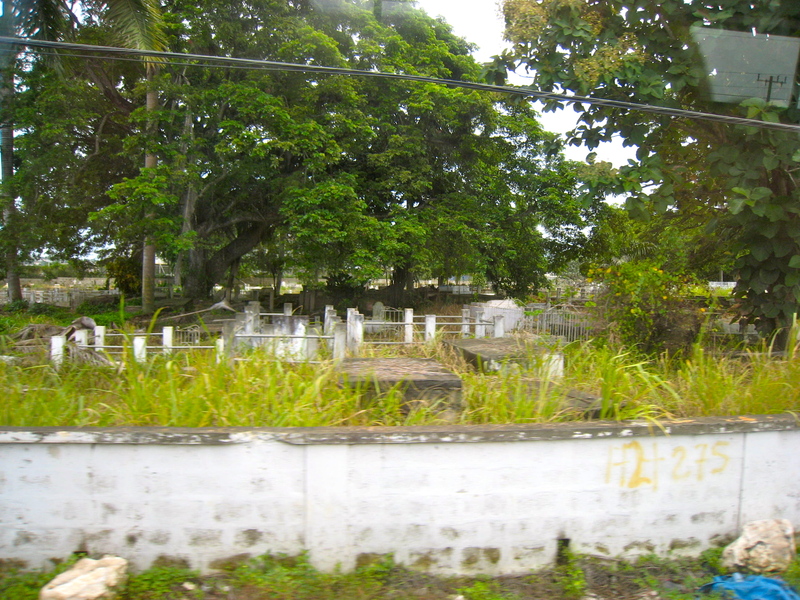 They are all above-ground tombs here in Jamaica. We traveled through a lot of small towns. The land rolls down to the ocean. Goats and cows and chickens are all around. 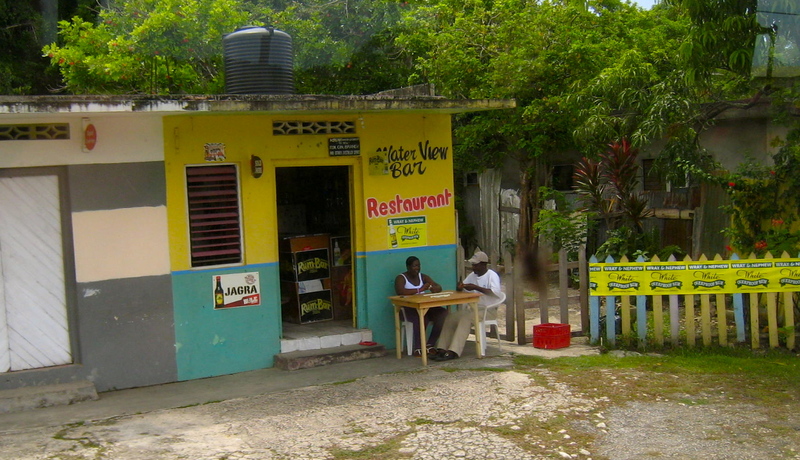 You see tiny stores and restaurants like these all along the roadway. But of all the things I saw, this was the most disturbing, on a number of levels. 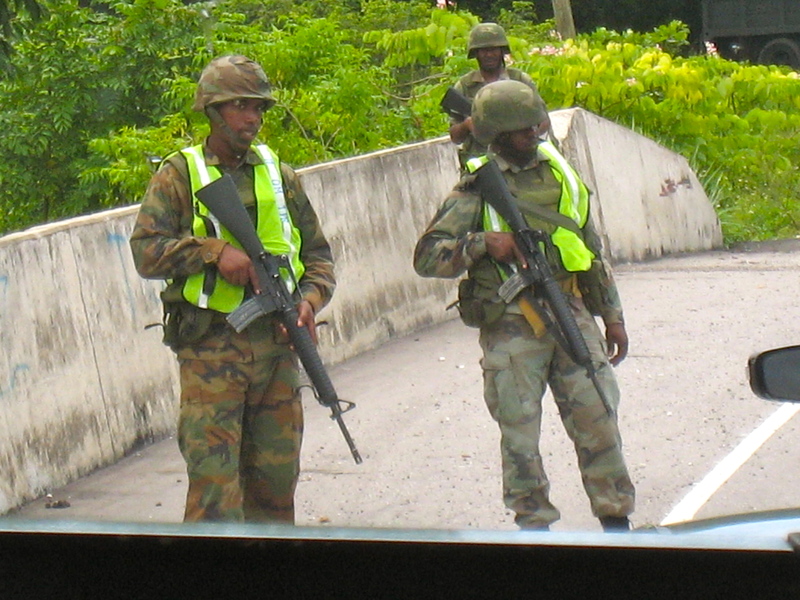 Army personnel had set up a roadblock and were checking IDs, searching cars and talking to residents. and this is a luxurious vacation??? ?